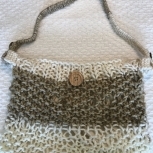 Women’s Hand Knitted Mini Market Tote (Color: purple/cream/grey). Accessories: Grey/white ribbon, cream buttons. 100% Bulky Acrylic. (Views: front, back, inside lining 100% cotton muslin natural fabric, side straps). Size: Approximately 14 inches wide by 15 inches long. Straps are approximately 26 inches long.